This past February, Olympian Simon Whitfield and his longtime bike mechanic, Brent Hooper launched Victoria’s Velofix Mobile Bike Pro Shop. “Servicing is always an issue for bike shops and so is transporting bikes for cyclists. So, yeah, there is a need and lots of support,” said Whitfield in a recent interview with B.C.’s Times Colonist. 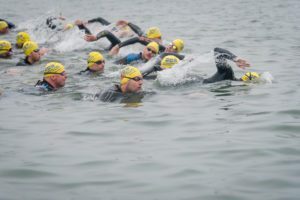 The retired Olympian has been demonstrating his entrepreneurial prowess in a number of projects. Just after becoming a partner, Whitfield used his energy and fame to land the franchise on an episode of Dragon’s Den that will air in September. Whitfield became interested in the venture after following the Vancouver-based business and tracking their user-friendly, though sophisticated online presence and booking system. Customers simply go online, book a time slot and a service from a comprehensive menu and the shop makes house calls. “Due to time constraints or not owning a vehicle, getting a bike to a shop can be challenging, so a mobile shop coming to you to fix your bike is very convenient” explained Whitfield. 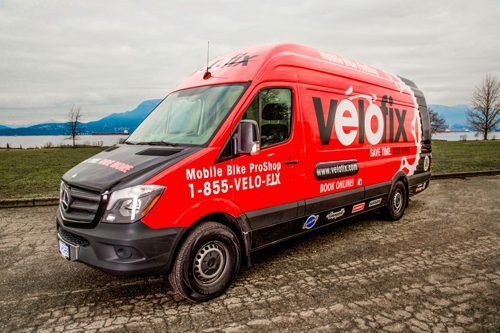 The brightly painted black and red Velofix van is a battery-powered, converted Mercedes Sprinter which is extra long and tall and fits a fully stocked shop. As the mechanic, Hooper has room in the van to work on four bikes at once and can transport up to 12. Although the mobile shop doesn’t have retail, it allows for a synergy with surrounding bike shops. “In that way, we’re complementary to bike shops because we’ll send people to them for gear and clothes,” said Whitfield. The pair are realizing an untapped market: “In terms of demographics, we’re seeing a lot of women,” said Hooper. The house calls mitigate the stigma of some bike shops as not so female friendly. The van can also be booked for festivals, races and cycling events.